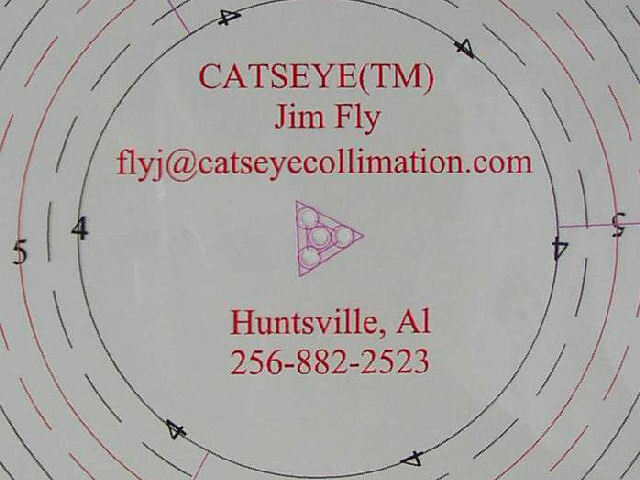 The heart of the CATSEYETM Collimation System is a precision, "calibrated" REFLECTIVE, TRIANGLE-SHAPED center spot placed on the primary which is illuminated with DIRECT lighting and generates very bright & distinct visual cues for quickly determining the necessary Primary & Secondary mirror adjustments. The Triangle Geometry Template or the HotSpot Geometry Template. 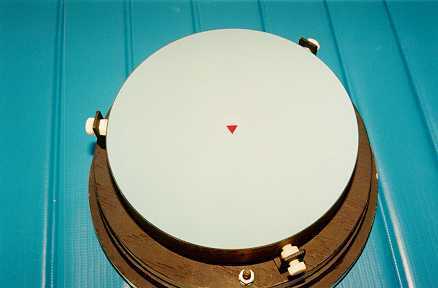 The system is readily used in daylight, but literally "shines" during NIGHTTIME collimation. 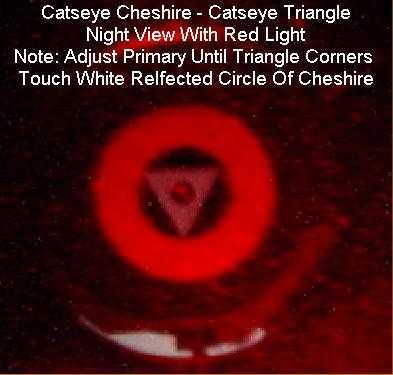 When a bright red LED flashlight is directed toward the Primary from the front of the scope, with the CATSEYETM or BLACKCATTM Cheshire in the focuser, the images of both the spot and the reflective ring on the business end of the CATSEYE/BLACKCATTM can clearly be seen. The primary mirror is then adjusted until each point of the triangle just "touches" the inside radius of the ring image (i.e. the triangle is perfectly centered in the ring). If the vertex points of the REFLECTIVE TRIANGLE center spot have been aligned with the (3) Primary cell adjustment screws at spotting, you will quickly learn which Primary adjustment screw(s) to turn and the direction to turn them. YOU'LL SIMPLY BE AMAZED TO SEE HOW QUICKLY YOUR SCOPE'S OPTICS WILL BE TUNED TO PERFECTION. 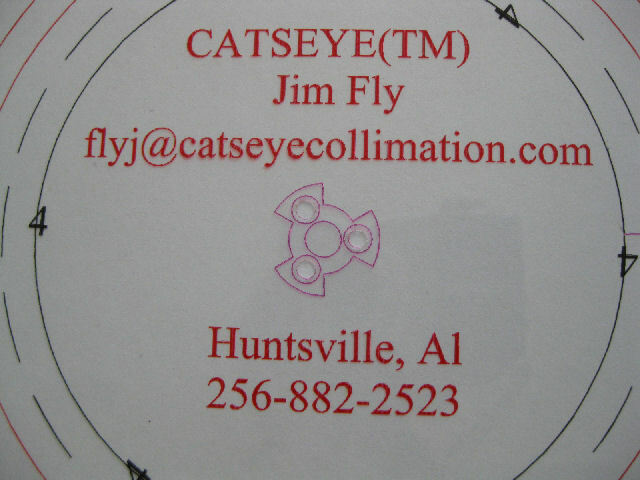 PRECISION COLLIMATION IS NO LONGER INTIMIDATING AND BECOMES FAST, EASY AND FUN!